My birthday recently crept up on me. All of a sudden, I was tasked with outdoing last year’s epic house party with little time to prepare. At first, I was overwhelmed with things I needed to organise; venue, transport, beverages and catering – the list goes on. Sounds a bit stressful, doesn’t it? It only took a quick search to realise that all of this was not only going to be costly but a hassle to bring together. Not to mention that last year we all dispersed in different taxis on the way to town – I didn’t want that drama again! There had to be a way I could tackle all of these concerns at once and make it easy on myself. Talking to friends about different ideas and possibilities, one of them mentioned Party Bus so I checked out their website. Party Bus is a portable licensed venue and it was exactly what I was after. There was no need to organise further transport or worry about any of my friends drinking and driving. They could even supply food and beverages. Party Bus was an easy, safe and fun option and something completely different. Party Bus made it easy. The Ultimate Party Bus package came with our own personal host, on-board bar, wicked lighting and great music – it was awesome! We even had a round of karaoke. We cruised around Auckland, stopping at Mission Bay and Devonport before we were taken to the city to enjoy the nightlife. We had a great night and everyone raved about it for weeks afterwards. If you’re overwhelmed with the thought of planning a party, consider these options for your next birthday party. Hopping from bar to bar with your mates never gets boring. At 50 seats, Standard Party Buses have the biggest capacity so they’re perfect for a large group. 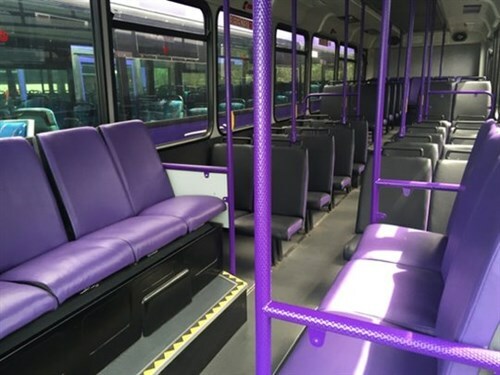 From $12 per person, these buses are great value and come equipped with party lights and lasers. A Standard Party Bus is the best option for those on a budget or those who do not require a licenced venue. If you’re after all of the features on a Standard Party bus but need an onboard licence, the Premium Party Bus is the way to go. With the party lights, lasers and music capability of a Standard Party Bus, the Premium Party Bus goes a step further with side-facing seats and the option to BYO drinks. An on-board host is available to serve your drinks to you. For all the added extras of the Premium Party Bus, the cost is $27 per person based on a full capacity of 37 people – that’s a cheap and fantastic night out! The Rock Party Bus is the newest of the licensed Party Bus fleet. With tinted windows and a private nightclub atmosphere, the Rock Party Bus is truly something else. 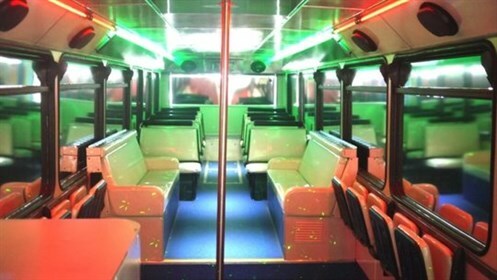 Amazing lights, side-facing seats, a dance floor and dancing pole are just some of the features of this bus. The on-board bar operated by your personal host is equipped to ensure you and up to 39 guests have an amazing time. With prices from $25 per person this is a great deal for a large group. When talking about the first of the luxury coaches available for hire, its name speaks for itself. 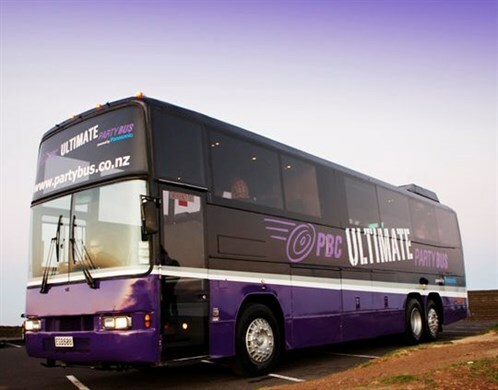 The Ultimate Party Bus is the epitome of awesomeness. This nightclub on wheels comes complete with a licensed on-board bar and personal host. The plasma TV, lounge-style seating, great music system, karaoke and unrivalled party lighting system really makes this bus stand out above the rest. Ultimate is the best option for a big night, perfect for a 21st. Seating 35, you can hire Ultimate from as little as $36 per person. This is the bus I took out for my birthday and I can tell you first hand that it is definitely a great experience that you need to check out for yourself. The most impressive vehicle in the Party Bus fleet is the the VIPER lounge coach. This bus is in a league of its own. This luxury vehicle is so much more than your usual corporate transport. Luxury lounge-style seating, an extensive on-board bar and your own personal host makes for a supreme executive experience. The licensed bar, mood lighting, sound system, karaoke and three LED TV screens will make your experience on the Viper Lounge Coach extraordinary. Seating 26 and holding a max of 30, VIPER can be hired for as little as $48 per person. Check out a virtual tour of VIPER here. 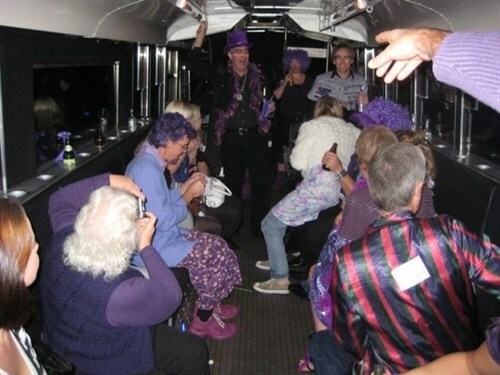 Age doesn’t matter to Party Bus. With so many options available, you don’t have to be turning 21 to have a memorable birthday. Whether you want to keep it simple or try something a little bit ritzy, Party Bus has it covered. So don’t let the party planning stress you out, relax and let Party Bus take care of it. Create great memories and share this fantastic experience with those closest to you. Contact Party Bus to book your next birthday bash and celebrate in style.